The ENCORE Transformation System is the “best in class” waste-to-energy technology. It meets all international environmental requirements and has set the bar for the toughest standards in the world. It is a highly efficient pyrolysis process for removing the valuable parts of waste and converting it to syngas in a patented all-in-one design. Eliminating many flaws that other systems have struggled with including batch loading, multi-station processing and dangerous single reactor, high-heat chambers, the ENCORE simply is the marriage of great scientific understanding with practical modular engineering. The System is a significantly more efficient and effective solution than incineration and landfill, negating the reason to burn and bury ever again. This system delivers both long term cost savings as well as generating revenue through the creation of electricity or synthetic fuel while surpassing all US, EU and International Standards and targets for CO2 emissions. All waste types can be processed: MSW, hazardous industrial and medical waste, sludge, tires, biomass etc. More detailed our scope of activity is described on the Development Process page. 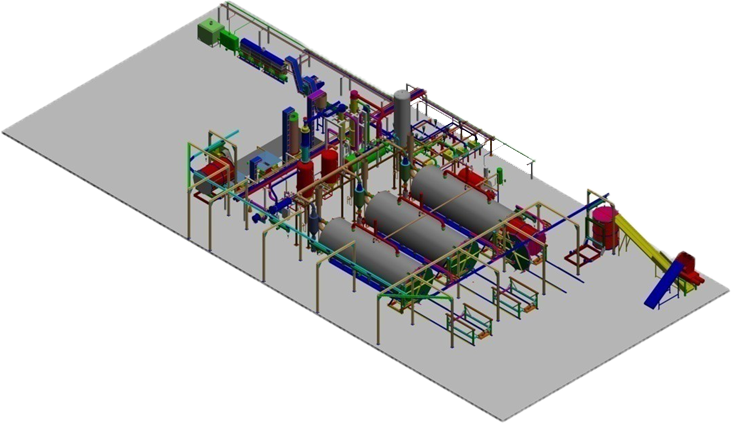 Short description of constructed plants can be found in the Advanced Pyrolysis Plants section. Below is video that describes real implementation of ENCORE technology to convert waste to electricity.